Cruising! Once an activity I did when I was 16 in a car, has taken on such a different meaning as I have gotten older. Amanda & I had always heard people say great things about cruises they had been on and from their pictures, it looked like a great experience. But, for the longest time, we…okay, I was against cruising. Why? Well, it seems that me and motion sometimes do not agree. For the most part, I do not get motion sickness often, but not knowing what to expect on board a ship, always made me leery of cruising. This was reenforced during our honeymoon trip to Key West in 2003. One day, we took a “fast cat catamaran” boat to the Dry Tortugas, which is a small island group an hour west of Key West. This boat ride was very fast on open water, and let’s just say by the time we got to the island, Amanda said she had heard of people turning green, but had never really seen it before. That was really my only negative experience with sea sickness. I had been on other boats on lakes, cruising the Mississippi River, ferries, even a dinner cruise around New York City; and never got sick. So, we decided 2 years ago, to take a short 5 day cruise in the Caribbean to see how it was, and how would I feel. I am happy to report that not only did I NOT get seasick, but we had a great time on board. And, we got the bug to want to go on more. Since then, we have cruised to Iceland & Norway, and our most recent cruise was the Eastern Mediterranean to see Italy, Croatia, Greece, and Turkey. We have three more cruises booked over the next year and half: Western Mediterranean (Spain, Tunisia, Cayman Islands), and two more cruises in the Mediterranean visiting more places in France, Italy, & Greece. So with this limited experience, and from the point of view from someone who really never thought cruising would be fun, the following are some Questions & Answers from my point of view that may help you either to decide to cruise or not? Q: Can you feel the waves on a cruise ship? A: Yes & No. I can feel the waves, but not as bad as you would think. 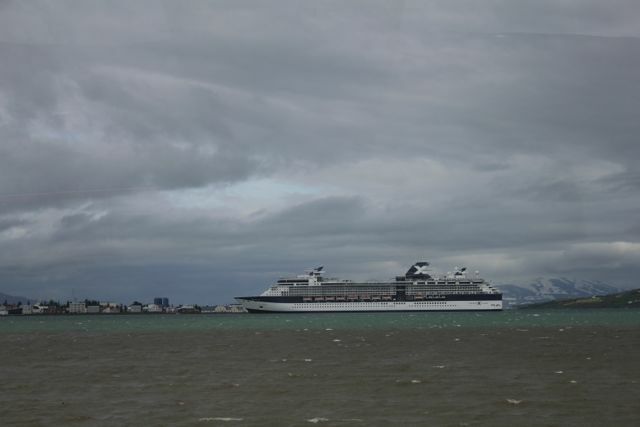 Our 3 cruises have been mid-sized ships (not the mega sized liners), and our room was at least 8 to 11 decks up. Cruise ships have these balancing arms in the water to help keep the rocking to a minimum. The higher you go and the further away from the middle of the ship, you “feel” it more. Sometimes, the sea does get a little rough, and the water in the pool starts to get wavy, and it can be a challenge to walk. But, the walking part actually starts to become fun. So, yes, you can feel the waves, but it is not as bad as it could be…. Q: Did you take any medication to help with seasickness? A: Yes, I brought dramamine. The first cruise, I popped the pills every few hours “just in case”, and then started to go longer in between taking. My second cruise, I only took them when the seas were really rough. My last cruise, I brought them, but did not take any. They made me a little sleepy, which is not what I am looking to do on board. So, bring them just in case….they are cheaper if you bring them, than if you have to buy them onboard. Q: What is your favorite part about cruising? A: The ability to unpack ONE TIME, and then be taken to many different places!! Each of our cruises, we have either taken excursions offered by the cruise ship, or just explored the port on our own. 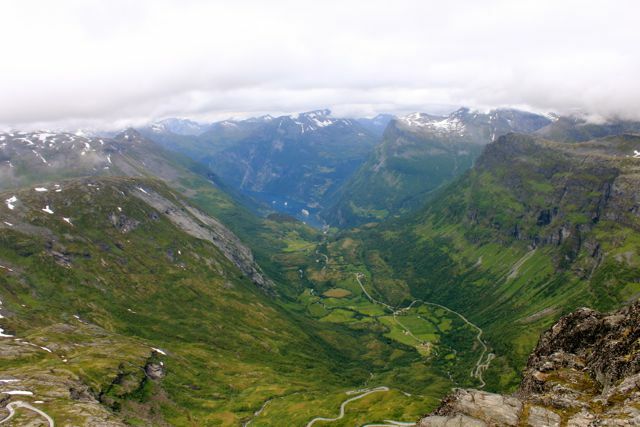 For example, the below picture was taken in Norway. Our cruise ship is the small ship in the blue water way down below. A cruise can take you to beautiful ports of call, you can go on adventure, and then return to your room onboard to go to the next destination….try doing that in a car! Q: Seems like it can be boring onboard, what is there to do on the ship? A: There are a lot of events for everyone, from every age. Usually there are a couple of variety shows, musicals, shows in the evening. During the day, there are different crafts shows & games held. Dance competitions, gambling, bingo, spa, spa, spa, and oh yeah, spa. You can either spend the whole day at the pool or spa, or do more physical activities, just depends on what you like to do. A: Food is included in the price of the cruise. Breakfast, lunch, and dinner buffets are open all day, and into the evening. There are lots of places to choose from with some places offering more specialized dinners like Asian cuisine or steak. The food and selection have been good experiences on our cruises. Drinks can be pricey on the ship. We usually buy a drink package before we board that helps with the price. The buffets can get really crowded, so it pays to learn what times to go to help ensure getting a table by the window, which is what everyone wants. Q: How do you book your cruises? A: Amanda has found a great website, cruises.com. They offer great deals on different cruise packages. We usually have a specific time itinerary (vacation days) we are looking for, and see what cruises are available. We will find a cruise on this website, and then check out the cruise on the cruise company’s website to get more information. We then use Google to read reviews about the ship, the company, and the ports of call. Finally, we go to YouTube, because somebody, somewhere took the same cruise before, and has posted their video. Q: What cruise company would you recommend? 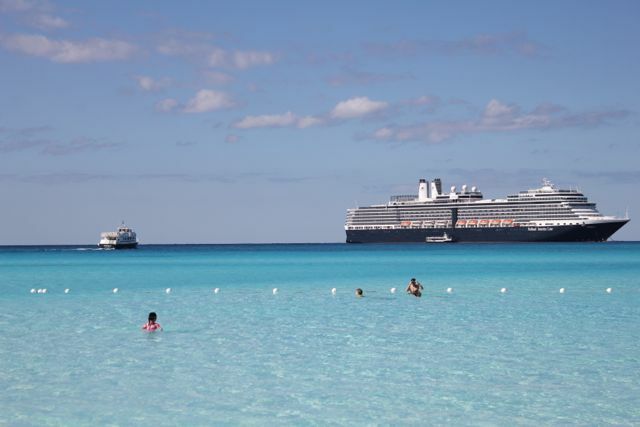 A: We have only been on 3 cruise liners before: Celebrity, Holland America, & Royal Caribbean. We can recommend them in that order with Celebrity & Holland American being almost tied. While we like Royal Caribbean, we got a sense it is more about volume of passengers with them. We have sailed on the mid-size ships, which helped the ports not feel too crowded when we docked. We have heard great things about Norwegian Cruise Lines, so that’s our next one. Q: I heard a lot of bad things in the past about cruises from a lot of people getting sick to ships breaking down, to the one off the coast of Italy sinking. How safe is it? A: Hundreds of cruises happen a year, and the few that have bad experiences make the news and those are the stories we hear. They do the best they can keeping people healthy, but if someone comes aboard sick, germs can spread. Fingers-crossed, we have had good experiences so far. Okay, enough Q&A. Hopefully, maybe, this helped a little? There is so much information available online about cruising. I just wanted to leave a post about our experiences, and how my preconceived, negative thoughts about cruising have totally not true. And, now, this is how we really like to travel, to see many different places, especially now since we are living in Europe.